Emitter layer is equivalent to CAEmitterLayer class. Emitter layer can be used to create particle system in QuartzCode. When you create emitter layer in QuartzCode, a default setting is used. The settings can be changed by using Layer Inspector. Emitter layer is created based on emitter cell properties. By default, emitter cell is automatically added when emitter layer is created. You can click ‘+’ button at Layer Inspector to add more emitter cell. 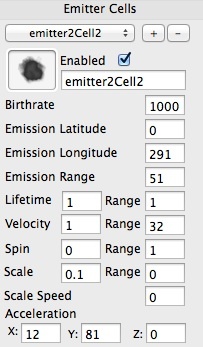 A copy of current selected cell will be added to the emitter layer. To change emitter cell image, simply drag a new image into the cell image holder. One notable keypath animation for emitter layer is emitterPosition. Using this keypath, you can make the trailing emitter animation along a path.